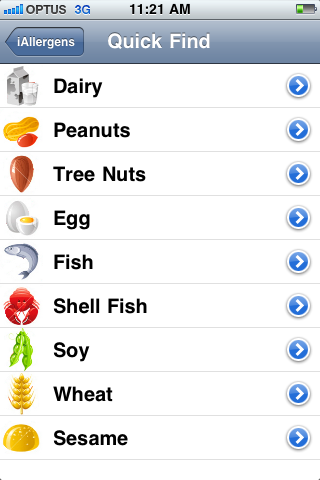 Food Allergy and Anaphylaxis allergen term finder. You need to know the scientific and technical terms that indicate common allergens. Did you know that Casein is actually a Dairy protein? I didn’t, when we were first diagnosed with Food Allergies and Anaphylaxis. This is something you and your kids with food allergies will have to learn. This app is for you, if you want peace of mind that you or your loved one know and learn all the allergen terms for your allergy. FAAN, Anaphylaxis Australia and other support groups have offline laminated cards that you can put on the fridge or your wallet. This is the iPhone / iTouch / iPad app version that you can take with you everywhere. eg. I was out the other day and my son wanted a lolly (candy) that we hadn’t had before. I checked the ingredients on the lolly wrapper and didn’t know what Humectant was. 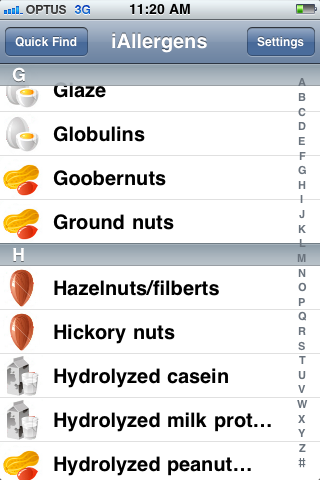 I started the iAllergens app and showed my son that Humectant wasn’t on the list of terms that he’s allergic to. All clear, and he enjoyed his lolly, stress free. This app is so simple to use. 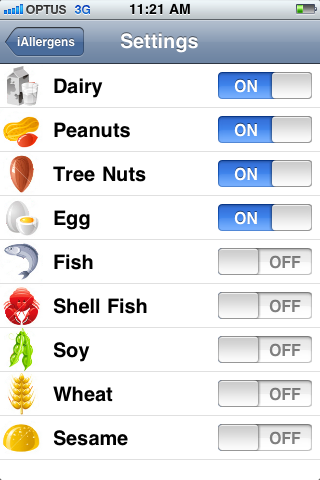 Choose your food allergy from the top 9 allergens, then with one click on the icon you get all the terms are in alphabetical order.